CALL FOR ABSTRACTS: We invite the submission of Abstracts for oral papers, poster presentation and workshops for the conference. 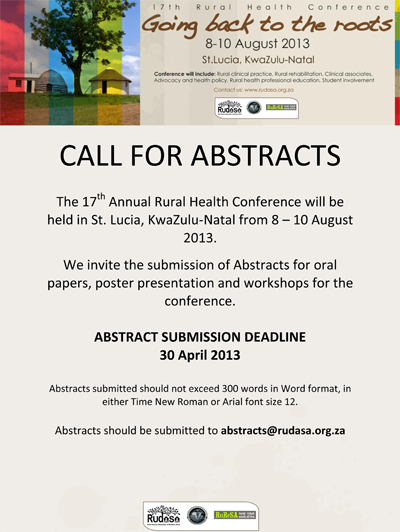 Abstracts submitted should not exceed 300 words in Word format, in either Time New Roman or Arial font size 12. SATuRN will have a session (approximately 2-3 hours) in the conference, which we will present HIV & TB drug resistance clinical cases and distribute the HIV & TB Drug Resistance and Clinical Management Case Book.